Edinburgh, Scotland's capital, evokes strong reactions. Throughout the centuries, its own residents have considered it with great conceit or disillusioned acceptance, and numerous prominent visitors have either loved it or loathed it. Whatever the reaction, it is clear that Edinburgh is no place for neutrality and a very quotable city. A city that possesses a boldness and grandeur of situation beyond any that I have ever seen. Nature took trouble over the site of Edinburgh. Edinburgh is the capital town and the handsomest of the kingdom of Scotland, distant only a mile from the sea, where Leith is its seaport. It stands on a hill, which it entirely occupies. The City is built between two steep hills and the castle on another, so that it may not be improperly compared to a spread-eagle. What a wonderful City Edinburgh is! What alternation of height and depth. The city stands upon two hills, and the bottom between them; and, with all its defects, may very well pass for the capital of a moderate kingdom. It seems like a city built on precipices, a perilous city. Great roads rush down hill like rivers in spate. Great buildings rush up like rockets. The ground on which Edinburgh is built is perhaps as singular, and in many respects inconvenient, as can well be figured.......from Holyroodhouse there begins the tail of a hill..... The ridge of this hill forms a continued and very magnificent street. 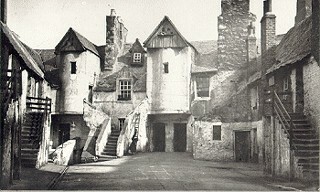 From its sides, lanes and alleys, which are there called wynds and closes, extend like slanting ribs; so that, upon the whole, it bears a striking resemblance to a turtle, of which the Castle is the head, the high street the ridge of the back, the wynds and closes the shelving sides, and the Palace of Holyroodhouse the tail. 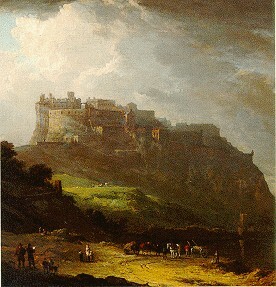 Edinburgh alone is splendid in its situation and buildings and would have even a more imposing and delightful effect if Arthur's Seat were crowned with thick woods and if the Pentland Hills could be converted into green pastures, if the Scotch people were French and Leith Walk planted with vineyards. It is the peculiar boast of Edinburgh, the circumstances on which its marvellous beauty so essentially depends, that its architecture is its landscape; that nature has done everything, has laid every foundation, and disposed of every line of its rocks and its hills, as if she had designed it for the display of architecture. The City is high seated, in a fruitful soil, and wholesome air, and it is adorned with many noblemen's towers lying about it, and abounds with many springs of sweet waters. Edinburgh has been happily compared to a flag - a thing of history, worn and stained with old deeds and great days, and starred with burning names. Edinburgh is a city whose history is written on its face. (In) Edinburgh there still remains its mystic background of history and romance in a setting of hill and valley and sea. Upon her high and windy ridge old Edinburgh has watched the march of Scottish history, and every ebb and flow of that often-stormy ride has left its mark on the ancient stones. Old Edinburgh is evidentially the result of the Scot's struggle against nature, against fellow humans, against weather and against their combined ferociousness. The view of Edinburgh from the road before you enter Leith is quite enchanting: it is, as Albert said, fairy-like. We entered Edinburgh in the dark, through mean, narrow streets, the aspect of which, by the faint light of dim lamps ill accorded with the magnificent promises of the splendour of the proud metropolis of the whole earth - of the capital of social elegance, and of perfect refinement. I was not yet too old to feel as if I were approaching a great magical city. Arrived at Edinburgh a little before sunset. As we approached, the Castle rock resembling that of Stirling - in the same manner appearing to rise from a plain of cultivated ground, the Firth of Forth being on the other side, and not visible. Always one of the first views, on approaching the city from a particular quarter, was that which gave you, once for all, the bold, romantic outlines of the whole the high, rock rounding Castle on one side, the monumented Acropolis of the Calton Hill on the other, the ridgy mass of buildings between, and behind all, the noble shoulder and peak of Salisbury Crags. I am not sorry to have seen the most picturesque (at a distance) and nastiest (when near) of all capital cities. Cragged, spired and turreted, her virgin fort beflagged. The castle on a loftie rock is so strongly grounded, bounded, and founded, that by force of man it can never be confounded; the foundation and walls are unpenetrable, the rampiers impregnable, the bulwarks invincible, no way but one to it is or can be possible to be made passable. It would make a good prison in England. The wrinkled face of the great Castle rock, that piles itself up in the clouds as from a glen in Skye instead of in the main street of a capital city. Then with one incredible leap up towers the crag - three hundred feet and the Castle and the ramparts all along the top. It was foggy, with sun struggling through and to see that thing hump its great shoulder into the haze was fine. It was almost overwhelming to think of all that has happened there. This braw hie heapit toun. Six, seven, eight storeys high were the houses; storey piled above storey, as children build with cards. The Old Town, with its irregular houses, stage above stage, seen as we saw it, in the obscurity of a rainy day, hardly resembles the work of men. It is more like a piling up of rocks and I cannot attempt to describe what we saw so imperfectly, but must say that, high as my expectations had been raised, the city of Edinburgh far surpassed all expectations. Tho' many cities have more people in them, yet, I believe, this may be said with truth that in no city in the world do so many people live in so little room as at Edinburgh. Well may Edinburgh be called Auld Reekie! The houses stand so one above another that none of the smoke wastes itself upon the desert air before the inhabitants have derived all the advantages of its odour and its smuts. You might smoke bacon by hanging it out of the window. In the Old Town the houses are appallingly high. From the Kings Pallace at the east, the city still riseth higher and higher towards the West, and consists especially of one broad and very faire (which is the greatest part and sole ornament thereof), the rest of the side streets and allies being of poore building and inhabited with very poore people, and this lengthe from the East to the West is about a mile, whereas the breadth of the city from the North to the South is narrow, and cannot be halfe a mile. The great street, which I do take to be an English mile long, and is the best-paved street with boulder stones that I have ever seen. The street is the glory and beauty of the city; it is the broadest street...and the longest street I have ever seen.....The street, if the houses which are high, and substantially built of stone were not lined on the outside and faced with boards, it were the most stately and graceful street that I ever saw in my life. With regard to the High Street in general, it may be observed that its length and width, beauty and magnificence are, by travellers, said to be excelled by none in Europe, and it is really far from being equalled in London. 'But Edinburgh,' said the man, 'was a beautiful city, more beautiful then than it is now. Of course the slums have been cleared. The Old Town was always my favourite. We used to love to explore the Grassmarket and so on. Architecturally speaking, there is no finer sight in Europe'. 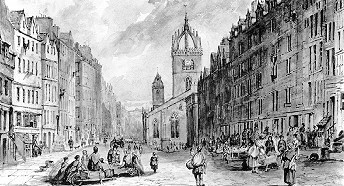 This (the Royal Mile) is, perhaps the largest, longest, and finest street for buildings and number of inhabitants not in Britain only, but in the World. What horrible alleys on each side of the High Street, especially downwards like passes of quarries of dark stone. I ventured down one, and hastened back to escape from the spitting of two children who were leaning out of an upper window. The wynds down which an English eye may look but into which no English nose would willingly venture for stinks older than the Union are to be found there. The main side streets are narrow, filthy and with six storey houses; one has to think of the great buildings in the dirty towns of Italy; poverty and misery seem to peep out of the open hatches which normally serve as windows. This accursed, stinking, reeky mass of stones and lime and dung. No smells were ever equal to Scotch smells. It is the School of Physic; walk the streets and you would imagine that every medical man had been administering cathartics to every man, woman and child in town. Yet the place is uncommonly beautiful and I am in constant balance between admiration and trepidation. One of the dirtiest cities I have ever seen. The New Town arose, growing from day to day until Edinburgh became one of the most handsome and picturesque cities in Europe. With regard to the buildings that have of late risen in this City with such incredible rapidity, we may venture to say, that, in regularity and magnificence, they are scarcely equaled, or at least not excelled, by any in Europe. As far as I am acquainted with modern architecture, I am aware of no streets which, in simplicity and manliness of style, or general breadth and brightness of effect, equal those of the New Town of Edinburgh. In their lifetime two Scottish architects, the brothers Adam, had produced one of the finest pieces of town planning in Europe the New Town of Edinburgh. When God Himself takes to panorama painting, it turns out to be strangely beautiful.....I believe I have found the beginning of my Scottish Symphony there today. Auld Reekie, fare-ye-weel, and Reekie New beside, Ye're like a chieftain grim and gray, wi' a young bonny bride. The buildings of Edinburgh are dispersed over a very irregular surface of ground, and placed partly in valleys, and partly on the tops and sloping sides of hills. In the middle of the Old Town they are mostly arranged on the side of narrow streets, are very high, and constructed without the least regard to symmetry, beauty, or domestic comforts. The New Town is unlike its ancestors, as if belonging to another country, climate, or class of inhabitants; for whilst the former has no pretensions to beauty, or even architectural design the latter is systematic, laid out with some regard to general effect, and according to a uniform and well digested plan. It is an odd place, Edinburgh. The Old Town and the New are separated by a broad and deep ravine, planted with trees and shrubbery. A more striking contrast than exists between these two parts of the same city could hardly be imagined. On one side a succession of splendid squares, elegant granite houses, broad and well paved streets, columns, statues and clean sidewalks, thinly promenaded and by the well dressed exclusively,...... and, on the other, an antique wilderness of streets and 'wynds', so narrow and lofty as to shut out much of the light of heaven; a thronging, busy and particularly dirty population; sidewalks almost impossible for children and other respected nuisances; and altogether between the irregular and massive architecture, and the unintelligible jargon agonizing the air about you, a most outstanding and strange city. I felt that I had seen, not one, but two cities a city of the past and of the present set down side by side, as if for the purposes of comparison, with a picturesque valley drawn like a deep score between them, to mark off the line of division. Beneath, the Old Town reared its dark brow, and the New one stretched its golden lines, while, all around, the varied charms of nature lay scattered in that profusion, which nature's hand alone can bestow. Nor is it long before you succumb to the singular fascination lent to all the spaciousness of the New Town by the contrasting gaunt perpendicular of the Old. Edinburgh, capital of Scotland since the 15th century, presents the dual face of an old city dominated by a medieval fortress and a new neoclassical city whose development from the 18th century onward exerted a far-reaching influence on European urban planning. The harmonious juxtaposition of these two highly contrasting historic areas, each containing many buildings of great significance, is what gives the city its unique character. After a residence of three months, we are going to leave Edinburgh with feelings of regret and gratitude for the many marks of goodwill and kindness we have received. Taken altogether, I do not know any town where it would be pleasanter to live. It is, in a great degree, the Geneva of Britain. Edinburgh seems like a Scandinavian capital. It's very different from England and very refreshing. We rode to Edinburgh; one of the dirtiest cities I have ever seen not excepting Cologne in Germany. I do not know any town where it would be pleasanter to live. It is, in a great degree, the Geneva of Britain. It is true that the Scottish capital can vie with Naples as to beauty. You have seen the famous street at Lisle, La Rue Royale, leading to the port of Tournay, which is said to be the finest in Europe; but which I can assure you is not to be compared either in length or breadth to the High Street in Edinburgh: and would they be at the expense of removing some buildings which obstruct the view, by being placed in the middle of the street, nothing could be conceived more magnificent. This town of Edinburgh is one of the fairest streets that I ever saw (excepting that of Palermo in Sicily), it is about a mile long, coming sloping down from the Castle..... to Holyroodhouse, now the Royal Palace; and these two begin and terminate the town. My dear Sir, do not think that I blaspheme when I tell you that your great London, as compared to Dun-Edin, 'mine own romantic town', is as prose compared to poetry, or as a great rumbling, rambling, heavy Epic compared to a Lyric, brief, bright, clear, and vital as a flash of lightning. The spectacle of the Old Town, seen from the New, is inspiring and splendid, and places Edinburgh, from the artistic point of view, on a level with Constantinople and Stockholm. We devoutly believe that no smell in Europe or Asia - not in Aleppo or Damascus in the present day - can equal in depth and intensity, in concentration and power, the diabolical combination of sulphurated hydrogen we came upon one evening about ten o' clock in a place called Toddick's Wynd. Except Naples (Edinburgh) is I think, the most picturesque place I have ever seen. Glasgow plays the part of Chicago to Edinburgh's Boston. Glasgow is a city of the glad hand and the smack on the back; Edinburgh is a city of silence until birth or brains open the social circle. Travellers have generally agreed that Edinburgh has a strong resemblance to Athens, and the inhabitants have apparently been willing to humour them by planting happy adaptations and variations of Athenian buildings on prominent places. Wad ding them a'! Wad ding them a'! Edinburgh, by reason of her heights and hollows, invests herself at night more wondrously than any city I have seen with this mystery of the vast terrestrial shadow struggling below with the lurid artifice of lamps, or star pierced from above till it yields its azure. What a spectacle is that of the ordinary walk along Princes Street at night, when the windows of the Old Town are lit, and across the separating chasm there looms darkly, or is seen more clearly, the high, continuous cliff of gables, irregularly brilliant with points of radiance. That turns from blue to brilliant black. Here I stand at what is called the Cross of Edinburgh, and can, in a few minutes, take fifty men of genius by the hand. Edinburgh is a hot bed of genius. The haughty Dun-Edin, the Queen of the North. Edina ! Scotia's darling seat ! One of the most handsome and picturesque cities in Europe. The most beautiful of all the capitals of Europe. It (Edinburgh) is a dream of great genius. Came to Edinburgh by night astonished at the city next morning, wild dream of a great genius. Finest city in Europe may be, in time, the world. There is no habitation of human beings in this world so fine in its way... as this, the capital of Scotland. Most to be remembered, the incomparable loveliness of Edinburgh. So Edinburgh is what a city ought to be, somewhere to live and walk about in. When I looked out in the morning it is as if I had waked in Utopia. There is no street in Europe more spectacular than Princes Street; it is absolutely operatic. Pompous the boast and yet the truth it speaks. A ''Modern Athens'' - fit for modern Greeks. It is quite lovely, bits of it. An English friend of mine was almost right when he declared Edinburgh to be the finest city in the world. Most Edinburgh born people of my generation at least, must have been brought up with a sense of civic superiority. We were definitely given to understand that we were citizens of no mean city. In time, and with experience of other cities, one would have discovered the beautiful uniqueness of Edinburgh for oneself as the visitors do. But the physical features of the place surely had an affect as special as themselves on the outlook of the people. The Castle Rock is something, rising up as it does from prehistory between the formal grace of the New Town and the noble network of the Old. To have a great primitive black crag rising up in the middle of populated streets of commerce, stately squares and winding closes, is like the statement of an unmitigated fact preceded by 'nevertheless'. 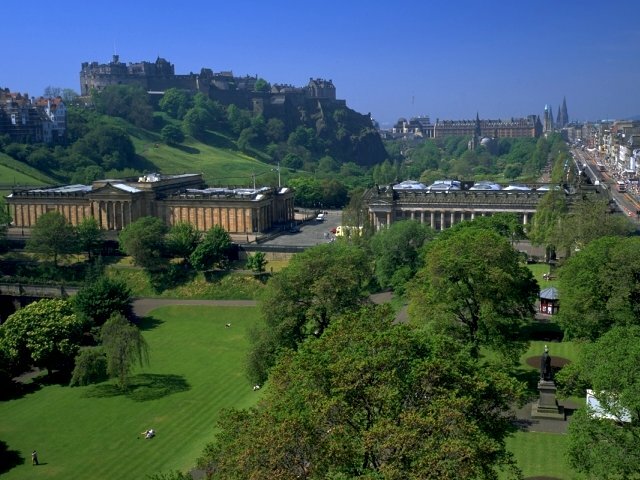 Edinburgh, even were its population as great as that of London, could never merely be a city. Here there must always be present the idea of the comparative littleness of all human works. Here the proudest of palaces must be content to catch the shadows of mountains; and the grandest of fortresses to appear like the dwellings of pygmies perched on the very bulwarks of creation. Everywhere all around you have rocks frowning over rocks in imperial elevation, and descending, among the smoke and dust of a city, into dark depths such as nature alone can excavate. Such was my first view of Edinburgh. I descended again into her streets in a sort of stupor of admiration. Living in Edinburgh there abides above all things, a sense of its beauty. Hill, crag, castle, rock, blue stretch of sea, the picturesque ridge of the Old Town, the squares and terraces of the New these things once seen are not to be forgotten. This profusion of eccentricities, this dream in masonry and living rock is not a drop scene in a theatre, but a city in the world of reality. A setting for an opera nobody performs nowadays an opera called 'Scottish History'. Princes Street is only hauf a street. I drove to the Butchers along Princes Street, all beastly with snow, but my breath was taken away by the beauty of it. This monument and statue, admirable for beauty and durability, I trust, will long adorn our city. 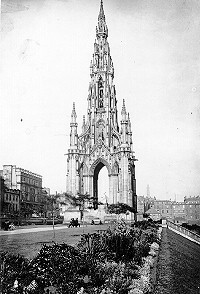 I'm sorry to report the Scott Monument a failure. It is like the spire of a Gothic church taken off and stuck in the ground. It is not for nothing that the very central and supreme object in the architecture of our present Edinburgh is the monument for Sir Walter Scott, the finest I think which has yet been raised anywhere on the earth to the memory of a man of letters. Tavern dissipation, now so rare amongst the respectable classes of the community, formerly prevailed in Edinburgh to an incredible extent, and engrossed the leisure hours of all professional men, scarcely excepting even the most stern and dignified. The most particular effect which I find of this Climate, is the Winds; which here reign in all their violence, and seem indeed to claim the country as their own. A person, who has passed all his time in England, cannot be said to know what a wind is: he has zephyrs and breezes, and gales, but nothing more; at least they appear so to me after having felt the hurricanes of Scotland. City of mist and rain and blown grey places. A minister of the Gospel from the West Coast identified Edinburgh as an 'east-windy, west-endy city'. Enchanting. It will make a delightful summer capital when we invade Britain. Who indeed that has once seen Edinburgh, but must see it again in dreams waking or sleeping? Edinburgh is a mad god's dream. Below you lies Auld Reekie, blackened and dried, an immortal herring, 'smeeked' for hundreds of years and cured in the sun. It (Edinburgh) is a fine place, stonily grey and strange of aspect. And yet the place (Edinburgh) establishes an interest in people's hearts; go where they will, they find no city of the same distinction. it stays with you, always. A city too well known to admit description. As long as sixteen or seventeen years ago, the first great public recognition and encouragement I ever received was bestowed on me in this generous and magnificent city-in this city so distinguished in literature and the arts.......coming back to Edinburgh is to me like coming home. Of all the cities in the British Islands, Edinburgh is the one which presents most advantages for the display of a noble building; and which, on the other hand, sustains most injury in the erection of a commonplace or unworthy one. Wi' thee but wi' a dowy heart.